Frame is made of black anodized aluminum with rounded corners. 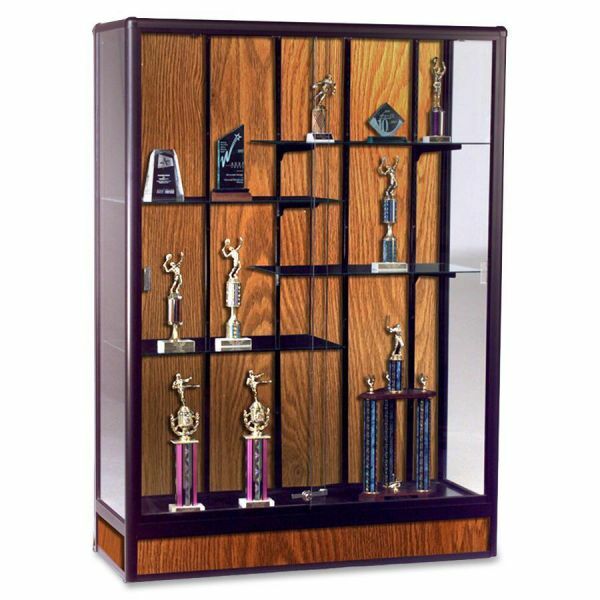 Locking sliding doors and adjustable shelves are made of .19" thick tempered glass. Laminate back panel is available standard in black, oak, or walnut. Custom laminates and custom cabinet sizes are also available. Available with an optional cornice and light set to illuminate items on display. Manufactured in the US of foreign and domestic materials. 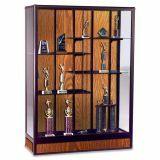 Balt Elite Freestanding Display Case - Freestanding display cases offer an elegant way to exhibit trophies, collectibles and valuables. The shelves adjust to hold items of different heights. Full view sliding doors are made of 3/16" thick tempered glass and include a tamper-proof lock. The cornice encloses a light panel that illuminates and enhances items on display. Offers laminate panels.